54 Jesus also said to the crowds, “When you see a cloud forming in the west, you immediately say, ‘It’s going to rain.’ And indeed it does. 55 And when a south wind blows, you say, ‘A heat wave is coming.’ And it does. 56 Hypocrites! You know how to interpret conditions on earth and in the sky. How is it that you don’t know how to interpret the present time? I love Jesus. I’ve committed my life to following him (though very imperfectly). I have what some would call a high Christology (I’m Trinitarian). I embrace his call to love God and neighbor. I just wish the Gospel writers would leave out passages like the one chosen for the thirteenth Sunday after Pentecost. I much prefer a theology of inclusion that seeks to build bridges. I’m an ecumenist to the very depths of my soul and I’ve long been deeply involved in interfaith work. So I don’t like this reading, because Jesus speaks here in apocalyptic terms of setting the world ablaze, and bringing division within the land. Indeed, division within the family. I want a message of peace, but in this passage Jesus reveals that this is not in the cards. I realize that there are preachers who embrace a message of division and destruction, but that’s not the message I choose to preach. I expect I’m not alone. I don’t know if I’m alone in this, but if I were preaching from this reading (I’m not), I might have to preach against it. I might want to tell the congregation: “this isn’t my Jesus.” But it is Luke’s Jesus and therefore it’s the canonical Jesus. So what should we do with a passage like this? Contextually Jesus is heading toward Jerusalem and his final confrontation with the powers—both religious and political (let’s remember that in the first century religion and politics were not easily separated). If you read Luke 12, you’ll find that it is filled words of warning. Don’t be greedy. Don’t worry. Be on the alert. Jesus wants his disciples to know that he is setting before them the right path, and inviting them to stay with him as he traverses it. That’s where the message of division comes in. If you choose to follow Jesus you will put yourself on a collision course with family and friends, as well as the powers. Rejection is likely in the offing, so are you ready to follow along this path? Choosing to follow Jesus in the first century wasn’t an easy decision. Jesus’ message of exclusive loyalty to the God of Israel, and that put him at odds with Roman society. Or more specifically, it put early Christians in a difficult spot as the message of Jesus moved out of a Jewish context into a Gentile one. So the first level of conflict would have been within the Jewish community. Would Jesus’ fellow Jews accept him and his message as the defining message of Judaism? Moving into Luke’s context, among Gentiles, things took another turn toward separation from society. It’s important to understand Roman culture. They were religious pluralists, who welcomed any and all gods, as long as you accepted Rome’s gods. The Romans built a Temple in Rome called the Pantheon, which enshrined this variety of divinities. Jews were different, of course, they were religious exclusivists, but Rome let them off the hook, because they were perceived to be a small ethnicity with their own peculiarities. Rome didn’t concern itself too much with Christians as long as they stayed within Jewish bounds. They were perceived to be a Jewish sect, and thus contained. Once the message of Jesus moved out from that context and began to spread among Gentiles with the ministry of Paul, things changed. Paul’s message was not one of go along to get along, at least on a religious level. That made Rome nervous. As I read the passage in my American context, where Christianity remains dominant, though it’s hold on society is eroding quickly, separation from culture takes on a different mode. There are those who wish to reclaim the nation for Jesus, so that Christianity can set the agenda. There are others who would want to withdraw, and leave the nation to its devices. Still others, want to make a difference without imposing a religious orthodoxy on the nation. This brings us to the question of allegiance. If we choose Jesus will that put us at odds with others? Will it cause division within the Christian community, as we sort out exactly what stands at the center of the Christian faith and practice. It seems that in our context some of the sorting out (division) is political in nature. Is Jesus calling us to rule, to separate out and create an alternative community, or simply work for a better community where all, whether Christian or not can flourish? I put myself in the third category. I have no interest in restoring Christendom, where the Christian majority forces everyone else to say Merry Christmas or say the Lord’s Prayer in school. I am committed to following the lead of the Prophets who called on the people of Israel to care for their neighbors, and unlike some I don’t feel that this involves limiting my responsibility to just the Christian community. The challenge here is that in western society, giving allegiance to nation over Jesus seems to be backed into our ethos. Since at least the time of Theodosius, with additional affirmation from Justinian, citizenship and church membership have often been intertwined. It’s one of the reasons why infant baptism was required and believer’s baptism rejected by mainstream Reformers. Choosing when to become part of the community threatened the status quo, much as reverencing Jesus did the same centuries earlier. In Luke 12 Jesus declares “I came to cast fire upon the earth.” In fact, Jesus wishes the world were already set ablaze. These are scary words—probably not the kind of words to base a children’s message upon. But there is something important in these words. They offer us an eschatological reminder that we need to keep our eyes open. We turn to the weather report so we can plan our futures. When going on a vacation I check whether to decide how to pack. Weather can be tricky to predict, but there are hints to follow. Jesus wants us to be checking the weather. He wants us to be alert to the realities around us. What are the challenges facing us as his followers? Indeed, how does the message of Jesus impact our very families? As Jeffrey Kuan reminds us, emphasizing such a message, especially among those who come to faith from within non-Christian families can do great harm. [Preaching God’s Transforming Justice, p. 358]. So, even as we give allegiance to Jesus, maybe a bit of tact is required as well. Jesus might set things ablaze, but maybe I need not do so! 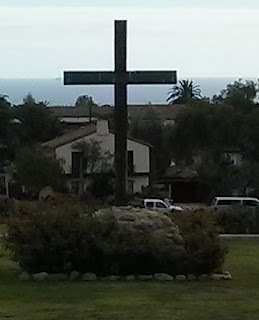 Let us consider the message offered to us carefully, so that we might stand firm in our faith, but seek peace as well. This is probably a very important caveat to be heard at time when the nation's political situation is extremely volatile. Let us not be the arsonist who throws the match into a drought-stricken California hillside! 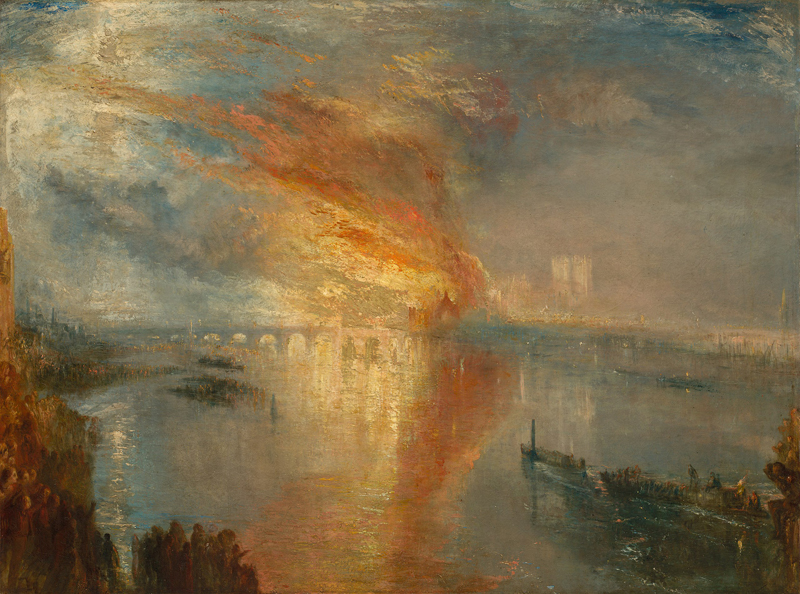 Picture attribution: Turner, J. M. W. (Joseph Mallord William), 1775-1851. The Burning of the Houses of Parliament, from Art in the Christian Tradition, a project of the Vanderbilt Divinity Library, Nashville, TN.http://diglib.library.vanderbilt.edu/act-imagelink.pl?RC=54219 [retrieved August 8, 2016]. Original source: http://commons.wikimedia.org/wiki/File:Joseph_Mallord_William_Turner_012.jpg. Sounds like you should preach this, Bob. Go for it! I probably could, but I'm already committed to Psalm 80!